Known as the Cathedral in the Vale, Uffington is considered one of the finest medieval churches in the county. It is a large cruciform building built almost entirely at one go by the Abbot of Abingdon around 1240. The central octagonal tower lost its spire during a storm in 1740. The church has a beautiful setting in the Vale of the White Horse and adjoins the old school (now a museum) which was attended by the titular character of 'Tom Brown's School Days'. The author, Thomas Hughes was the grandson of the local vicar and he was christened in the font at Uffington. There is a memorial to him nearby. The church has a dramatic south porch with fine original 13th century scrolling ironwork on the door. There is also the most complete set of consecration crosses in the country (eleven out of twelve survive as originally set up by the Bishop at the time of the church's dedication). Inside, the moulded trefoil arched sedilia is worthy of note. 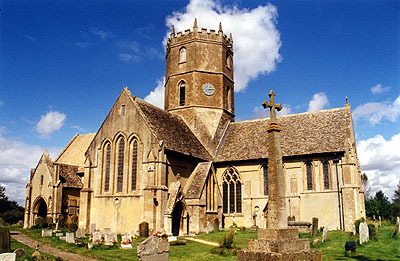 Architecture: Complete early 13th century cruciform church. Bizarre eastern chapels possibly from a restoration of 1677-9. Monuments: Edward Archer 1603 Reredos; John Saunders 1638 semi-reclining effigy.